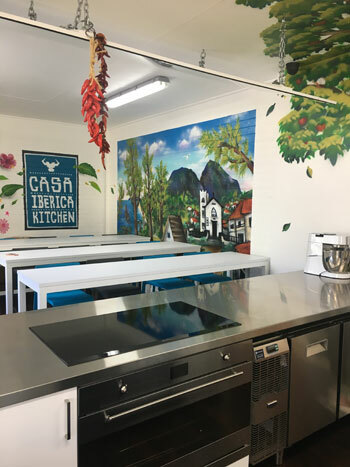 Casa Kitchen is a fully equipped, purpose-built kitchen space ready for cooking school classes. The venue in Alphington comprises a Casa Iberica shop/deli, warehouse & salami making factory – all uniquely surrounded by fabulous graffiti art. Escape to the Casa Kitchen and book in for a fun and informative cooking class. The themes and chefs will change throughout the year with content changing from Spanish to Columbian & Mexican. Other classes will explore the exciting products stocked at Casa Iberica and their different uses. We will have a range of chefs hosting the classes bringing their own expertise in different cuisines who will have a chance to show off their individual cooking styles. Standby for new classes being posted! Classes make a wonderful gift or team building idea or can simply develop your cooking skills and techniques in new areas. Choose a class that interests you and come along to learn, cook and eat with family and friends or meet people while participating in a Casa Kitchen culinary experience. Copyright © 2019 Casa Iberica Deli. All Rights Reserved.